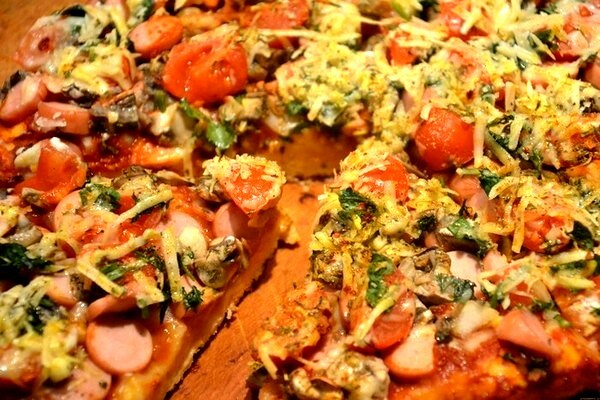 Pizza is Simple and Tasty"
For making homemade pizzas, you can use a different dough. Some Housewives prefer to buy a ready-made, but make it quick you can own. Combine mayonnaise, 3 eggs, soda, slaked vinegar, and 8 tablespoons of flour in a deep bowl. Thus you will get the dough. His consistency, it should resemble thick cream. The form for baking grease with vegetable oil (so pizza is not burnt, you can sprinkle the form of semolina) and place it on the dough. It will be easier to do this using a tablespoon dipped in water. Grate the sausage, cheese and tomatoes. Put these ingredients over the dough. Finely chop the onion, pickled cucumbers and champignons and put them there. Remember that all products need to be spread evenly across the surface of the pizza. On top of the pizza need to be watered with mayonnaise and ketchup. Their number will depend on your taste preferences. Put the baking pan in a cold oven on 180 degrees. Bake the dish to about 40 minutes. Remember that when cooking a pizza is salt you do not need, since all of the ingredients in the dough and in the filling quite salty.